Carly received her Bachelors in Sports Studies, Fitness, and Exercise Science from Indiana State University. She is certified as an ACE certified Health Coach, Group Exercise Instructor and Indoor Cycling Instructor through the National Exercise Trainers Association. Carly is trained in HealthCare Providers CPR and AED. 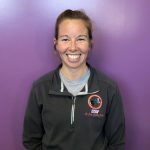 Carly has over 16 years of experience, with three years in a physical therapy setting and 13 years in a fitness setting. Kristin attended Indiana State University to receive her Bachelors in Exercise Science as well as her Masters in Food and Nutrition. She is a certified Group Exercise Instructor through AFAA and is also Indoor Cycling certified through NETA. She also is a certified Performance Enhancement Specialist from the NASM and ACE certified Health Coach. Kristin is certified and trained in HealthCare Providers CPR and AED. While attending ISU, she interned for the college’s Department of Strength and Conditioning. She previously worked for the ISU women’s soccer team, assisting them with proper nutrition. Kristin has over 13 years of experience in fitness and nutrition. 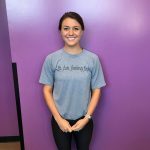 Macey is a graduate from Indiana State University and received her Bachelors in Exercise Science while minoring in Strength and Conditioning. She is a NETA Certified Indoor Cycle instructor along with a NETA Group Exercise Certification. Macey is certified and trained in HealthCare Providers CPR and AED. Macey is also ACE Personal Trainer certified. Macey has over 2 years of experience in fitness. Anna is an Indiana University graduate with a Bachelors in Public Health. She is a NETA Certified Indoor Cycle instructor with a NETA Group Exercise certification. Anna is certified as an ACE certified Health Coach as well as a Personal Trainer certification through ACE. Anna is trained in HealthCare Providers CPR and AED.